You will love these veggie lettuce wraps with peanut sauce! Fresh and easy vegetarian lettuce wraps that make a healthy, light lunch or crowd-pleasing appetizer. 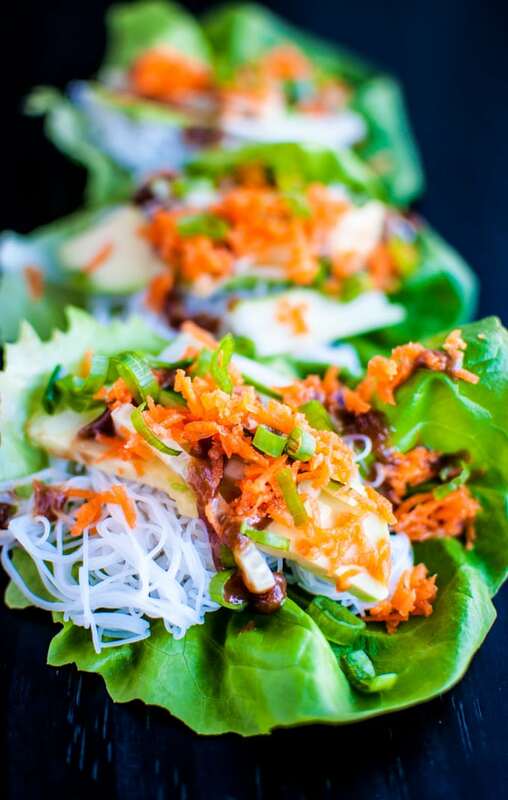 These lettuce wraps are filled with avocado, vermicelli, carrots, cucumber, and spring onions, then topped off with a sweet peanut sauce. I spent some time crushing peanuts (with a ZipLoc and a rolling pin) to sprinkle on top of these wraps, but of course I ended up forgetting to put them on for the photos. Oops. 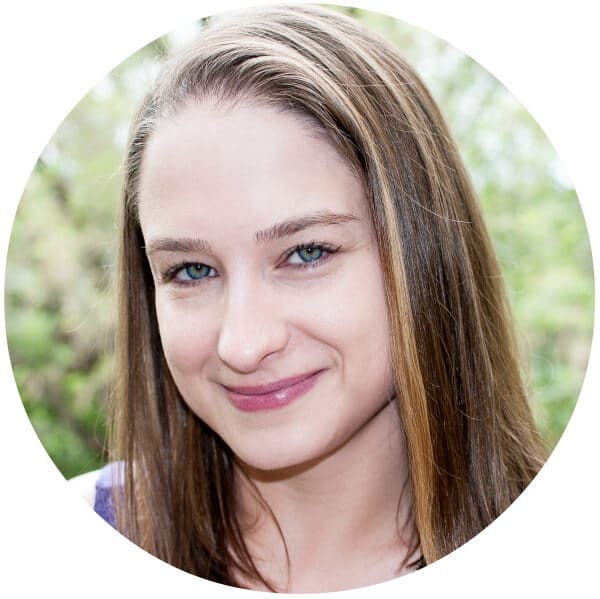 My husband says I really need to start writing photo staging lists since this isn’t exactly the first time I forgot to put something on for the photos. I probably should. So feel free to add the crushed peanuts to these as well… I did after I took the photos and it was really yummy. These peanut sauce lettuce wraps are basically a deconstructed (lazy?) version of the much more labor intensive salad rolls my family and favorite Vietnamese restaurant make. I wanted the peanut sauce to be really easy for these wraps, and this is about as simple as you can get. Just chuck the ingredients in the pan, warm them up, stir, and you’re done! If you want some heat you could always add some chili paste. I hope you like these veggie lettuce wraps with peanut sauce! Easy and healthy veggie lettuce wraps with a delicious peanut sauce! Cook vermicelli according to package directions (this does not take long). Set aside and let cool. Prepare peanut sauce by adding all sauce ingredients to a small pan and cooking over medium heat, stirring frequently, until ingredients are combined and it's hot (less than five minutes). Slice spring onions, julienne cucumber, and grate carrots finely. Slice avocado. 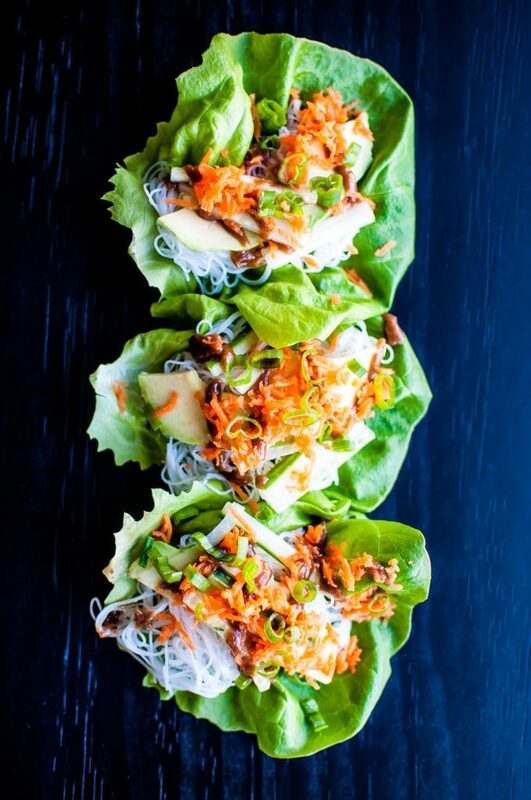 Assemble lettuce wraps by adding vermicelli, carrots, cucumber, avocado, spring onions, and drizzling the peanut sauce over them. You can use any extra sauce for dipping the wraps. Wow! Amazing! I love these wraps! I am so into peanut sauce and I do not have it often enough. these look super and healthy and fun to eat. Thanks Annie!! I am so glad you like the look of them! Nice and fresh! Yum! They make a great appetizer. I made these wraps for a wedding shower last weekend and they were a huge hit. I added some sliced garlic shrimp just because. That’s awesome! Glad everyone enjoyed them. Garlic shrimp sound delicious!! Hi there! This looks delicious; I found it on Pinterest and am adding it to my meal plan for this week. I’m not sure you’ll see this, but on the off chance, could you tell me if you use regular peanut butter or “natural” (just plain peanuts and salt) style? Thanks! Can’t wait to make this. These were great, thank you! I added a bit of lemon juice, sriracha, & honey.